Have you already been at the Million Dollar Homepage? If you have an envious streak, you probably shouldn't read this. Because chances are, Alex Tew, a 21-year-old student from a small town in England, is more clever than you are. And he is proving it by earning a cool million dollars in four months on the Internet. He had the brainstorm for his million-dollar home page, called, logically enough, www.milliondollarhomepage.com, while lying in bed thinking about how he would pay for university costs. The idea: turn his home page into a billboard made up of a million dots, and sell them for a dollar a dot to anyone who wants to put up his logo. A 10-by-10-dot square, roughly the size of a letter of type, costs $100. Tew sold a few to his brothers and some friends, and when he had made $1,000, he issued a press release. 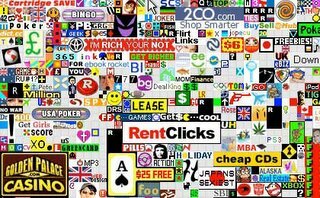 That was picked up by the news media and spread around the Internet, and soon enough, advertisers for everything from dating sites to casinos to real estate agents to The Times of London were putting up real cash for pixels with links to their own sites. Tew's home page now looks like an online Times Square, festooned with a multicolored confetti of ads. "All the money's kind of sitting in a bank account," Tew said from his home in Wiltshire in southwest England. "I've treated myself to a car. I've only just passed my driving test, so I've bought myself a little black Mini." Meanwhile, Tew has had to juggle running the site with his first term at university, where he is studying business. "It's been quite a difficulty trying to balance going to lectures and doing the site," he said. Don't miss this one and that one. LOL I really found the 'own a piece of desktop' hilarious.